There’s nothing simpler than setting off on your own two feet. Over half of car trips in the United States are less than 1 mile, or roughly the distance covered in a brisk 20-minute walk. Walking provides flexibility and control over your schedule. More people walking promotes security by putting more activity on the street, supports first and last mile connections to transit, and provides overall individual well being. As our Downtown grows, adding jobs and residents, we may struggle with congestion on the roads, but we’ll never run out of room for people walking. When deciding where to live, we invite you to choose a home within walking distance of work if possible. Then no matter what you’ll have a foolproof way to get to work. It used to be that people decided where to live and then thought about their commute. But Walkscore empowers you to factor your commute into your housing choices. 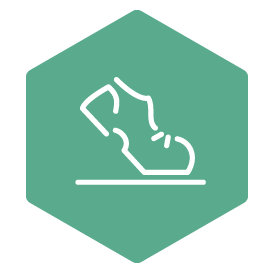 Walkscore calculates the walkability of any urban address, incorporating transit access, basic necessities, and apartment listings. Feet First, Washington state’s only pedestrian advocacy organization, has been the established leader in working to ensure all communities across the State are walkable. Feet First works on Safe Routes to School programs, creates neighborhood walking maps, sponsors walking events and advocates for programs, policies, and capital spending to benefit walking. Want to quickly know which Seattle streets are the best for walking? The Seattle Walking Map differentiates the lovely boulevards from the traffic-filled arterials, and the pedestrian shopping areas from the quiet neighborhoods. Check it out! For someone with limited mobility, using the sidewalk in a new area can be like driving with no directions, hitting dead end after dead end: there are many obstacles that can prevent access. The goal of AccessMap is to enable safe, accessible trip planning on pedestrian ways for people with limited mobility.